The third race meeting of the season for Team LNT turned out to be by far the most significant one in the team’s short history. 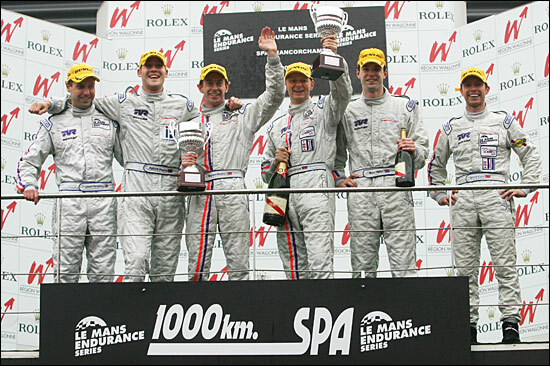 Third race meeting – third different series… from Sebring (ALMS) to Donington Park (British GT) to Spa in Belgoium (LMES). #82 Pat Pearce / Marc Hynes / Jason Templeman. With ultimately a 47 car entry at Spa, and 16 cars in GT, this was in most respects about to become the biggest challenge yet. There aren’t any ‘factory’ Porsches in the LMES – so here was a level playing field in the European series: privateer teams against privateer teams. 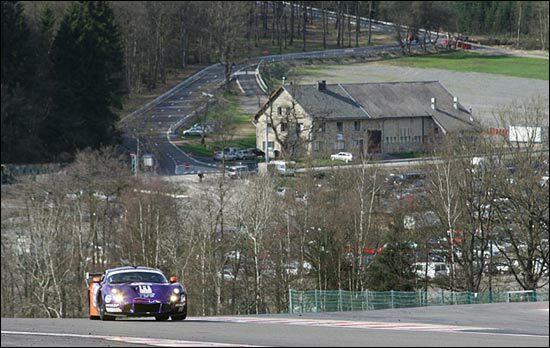 But there were ten Porsches and two Ferraris to beat – plus another TVR, and a Dutch Spyker. Lawrence’s description was “the red Fiats and the Beetles”, for the main opposition. Friday’s free practice sessions were run in bright, dry conditions – and there they were at the end of the second, one hour session, in third and fifth fastest positions, surrounded by the best of the Ferraris and Porsches. The day had started with some lively humour at the expense of Pat Pearce (sporting a black eye), and had ended with the two TVRs right with the serious competition in the GT2 Class. And then it rained… and that was the end of the fine weather for this meeting. 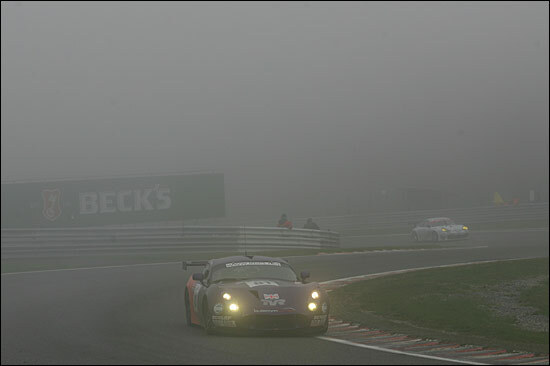 The two TVRs stayed on dry settings for the morning session, and despite that were still quick. Pat Pearce: “We were still setting good times. We know the car is good in the wet, and the Dunlops are giving us good traction.” The #82 T400-R was fourth fastest in GT2, the #81 fifth fastest. This was looking very promising. Qualifying involved a quick 20 minutes on track, so only one driver would try for a time in each car – but the weather had things to say about the session length. 20 minutes became 14, as low cloud made visibility too limited. Frustration all round, because the track was actually drying. Pat was still eighth fastest, only just over two seconds slower than the pole position Porsche. 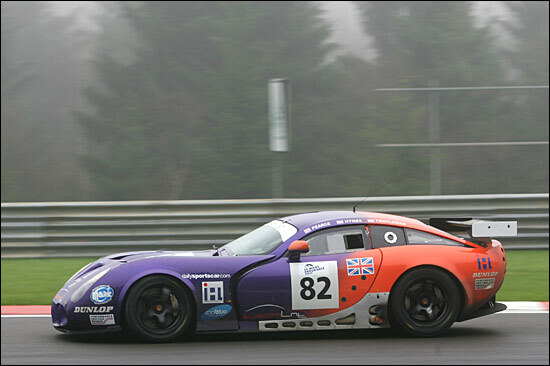 Warren Hughes qualified #81, and he was fourth fastest, a second away from pole – behind two “Beetles” and a “red Fiat”. The scene was set for a classic 1000 kilometre race on Sunday. Unfortunately, the weather was just as bad as on Saturday afternoon, and the whole event would be run in the most miserable, overcast conditions. But Team LNT, initially in the hands of Warren Hughes in #81 and Marc Hynes in #82, put on a marvellous show throughout. 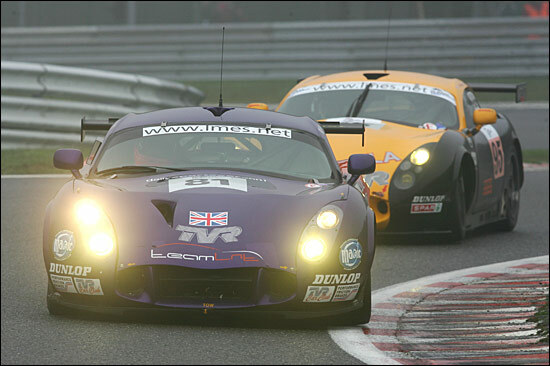 Not only did the TVRs outlast the Porsches and Ferraris, they were right on the pace of them too. Hughes and Hynes both started on intermediate Dunlops, and that proved to be the right choice, especially as the track ‘dried out’ – a loose term, because in the cold, perpetually damp conditions, the water had nowhere to go. 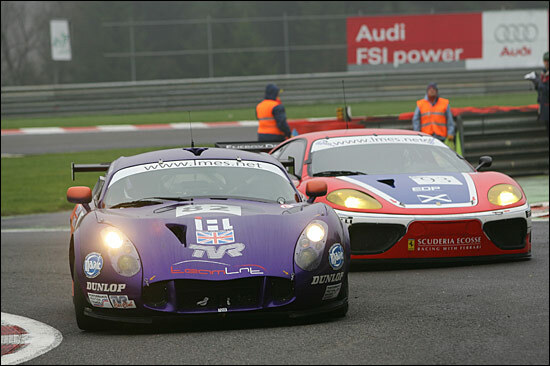 The main rivals turned out to be the Italian-entered GPC Ferrari, GruppeM’s Porsche and Scuderia Ecosse’s Ferrari – and whatever these three entries tried, they couldn’t escape from the attentions of the two TVRs. Babini in the GPC Ferrari was the quickest early on (after a brief, early lead for Michael Vergers in the IN2Racing Porsche), the Italian using the 360’s excellent braking to good effect, but there were Hughes and Hynes, always in the top six – and about to improve on that. Switches to Pat Pearce and Jonny Kane under the first safety car saw these two running second and third in class, the former pounding round with the latter just ahead, both cars setting their fastest laps on lap 43, just three tenths between them. The GPC Ferrari suffered once Babini stopped driving, while the GruppeM Porsche went out with engine failure – so that left one effective rival at the front, the Scuderia Ecosse Ferrari. Great job, just a slight hiccup to hand over to Marc Hynes, Jason overshooting the LNT pit. That delay let another Porsche, the Autorlando version, get closer to #82 – in a furious battle for what had become second position, because…. Jonny Kane had got the better of that Scuderia Ecosse Ferrari, even including a clash with a rude prototype. Warren Hughes took over for the run to the flag, on slicks. “The circuit was getting damper, and it was a nightmare, because the last safety car period meant that I lost all the heat in the tyres.” But the GT2 class had been well and truly seen off by the #81 car, and Warren had a lap lead over – Marc Hynes in #82. “The plan was to put me back in for the last stint,” explains Pat Pearce, “but it was the right decision to leave Marc in. He knew the conditions. Marc Hynes was on intermediates, and although he looked to be in charge, there was to be a late-race drama. “The car had a big problem at the rear end during my stint, possibly a broken roll bar, which made it really tricky to drive. The boys warned me that the (Autorlando) Porsche was catching me for position and you’ve got to do all you can in that situation. I saw the 911 closing in fast and decided that the only way he was coming past me was on the grass - and he tried that. The challenge certainly helped my pace and I was really driving around quite a big (handling) problem." 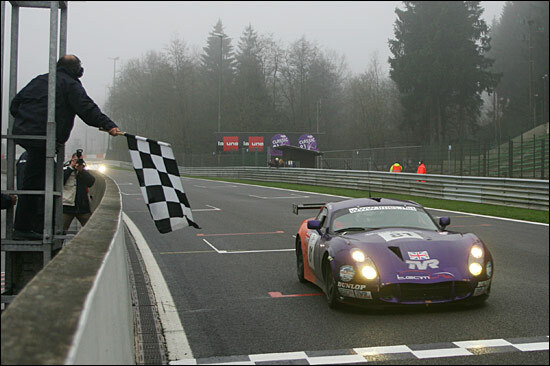 Marc Hynes held off the Porsche – by a fraction under half a second, after nearly 1000 kilometres around Spa. 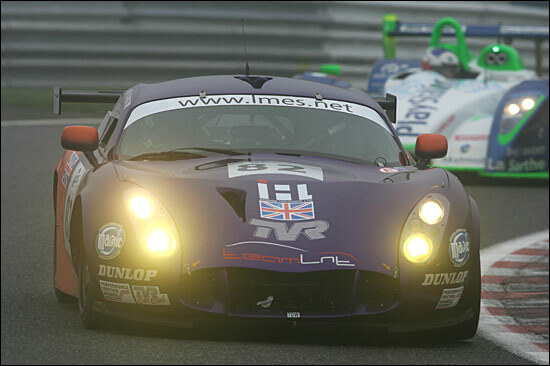 So that was it: not only had the TVRs managed a first international win for the Blackpool manufacturer, the cars were first and second at the flag. The team took over a pizza restaurant in Malmedy on Sunday evening – when the collective achievements really started to sink in. 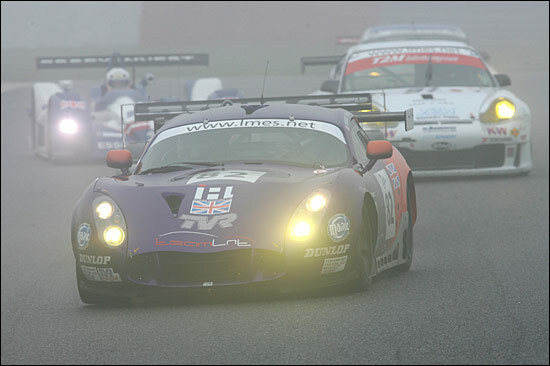 Team LNT had done what the team owner wanted – they’d proved themselves on the track, in emphatic style. "Massive thanks to Muggo (Alan Mugglestone), Rocket (Rodney Farrell) and all the boys," concluded the boss. "This is a great result for all the effort that’s gone in building, developing and testing the cars."